After Jerry’s apartment building installs new “low-flow showerheads,” Kramer and Newman purchase the Commando 450 showerhead for maximum “power.” In the final scene of the episode, Kramer appears to be injured when he uses the Commando 450 for the first time. 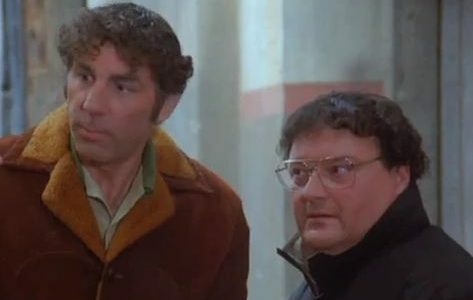 Does Kramer have a claim against the manufacturer for the injuries? If Kramer wished to pursue a claim against the manufacturer of Commando 450, he would need to show the 8 elements for strict liability for a defective product: (1) Proper plaintiff, (2) proper defendant, (3) proper context, (4) defect, (5) cause in fact, (6) proximate cause, (7) damages, (8) the absence of any defenses from the manufacturer. Let’s take these at a low flow pace – one at a time. (Note: the link lists five, but we’ve broken up two of them for more nuanced analysis. Let’s go through the elements that are fairly simple to show. (1) Kramer would be a proper plaintiff since he is a user of the product that was put into the market. (2) Anyone in the distribution pipeline would be a proper defendant. This means that both the manufacturer of the Commando 450 and the the salesman would be proper defendants. (3) The context is appropriate as we are dealing with a product, not services (like a plumber simply installing the showerhead but not otherwise involved in the sale). (5) A cause in fact occurs when the defect was in existence at the time it left the manufacturer’s hands. There is likely a cause in fact as the Commando 450 was designed “for elephants” when it was produced and sold. (7) We are assuming that Kramer suffered damages as a result of the use of the shower head. We see Kramer dramatically fall backwards while in the shower, and almost certainly suffered some kind of injury. Now, comes the more difficult analysis. (4) Kramer would need to show that there was some kind of defect with the Commando 450. This can happen in any of three ways: (A) Manufacturing defect; (B) Design defects; (C) Failure to warn. Let’s take them one-by-one. (A) There does not appear to be a design defect since the product worked exactly as intended, it provided water pressure that was full of “power, man. Power.” (B) There might be a design defect, as it provided the intended high pressure but injured Kramer in the process. Still though, it was designed for use with elephants – not people. So there is likely not a design defect. (C) But there might be an inadequate failure to warn. The salesman does note that he “does not sell that one,” as “it’s only used in the circus. For elephants.” But, in the end, he does sell them the shower-head and does not warn them about what might happen if they were to use it. (6) Kramer would also need to show that there was proximate cause between himself and the person he is suing. To do this, Kramer would need to show that there was no superseding cause between himself and the defendant. For example, if the manufacturer of the Commando 450 were to have specifically told the salesman not to sell the product to anyone except those in the circus, or specifically instructed the salesman to warn about what might happen to a person who used the Commando 450 in their shower, then the weak and ineffectual warning by the salesman would prevent Kramer from showing proximate cause with the manufacturer. Or, if the salesman had stolen the Commando 450 from the circus and was selling them on the black market, then Kramer would also be unable to show proximate cause with the manufacturer. While we have some indication that this salesman is not on the up-and-up there is no direct evidence that this is a black market sale. So we will assume that there is proximate cause. (8) Finally, the Manufacturer of the Commando 450 could try to assert a number of defenses. They could first claim that Kramer misused the product by installing it in his personal shower when it was designed for elephants. But it seems foreseeable that someone who prefers “power, man” might use a shower head like the Commando 450. If the use of the product is foreseeable, then it is not being misused. Kramer also did not alter the product, he simply installed it in his shower. Lastly, Kramer did not assume the risk. He immediately tried to turn off the shower as soon as he realized that it was way too strong to be used by a normal person. While we cannot be completely sure if a jury would find the manufacturer liable for Kramer’s use of the Commando 450, it seems like all of the elements are present for him to turn on a pressure filled case. Certainly the Commando 450 does not like the sound of that.